What’s a shrub? Ask Bauman’s Best Botanicals. A shrub from Bauman’s Best Botanicals. These shrubs are not the kind you find in the garden. Although, like flowering bushes, they have lovely colors and fragrances. 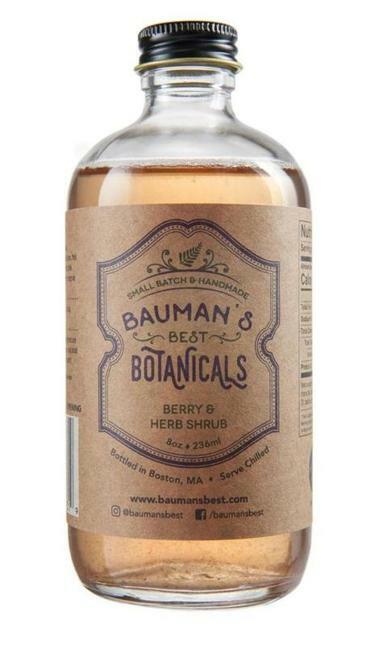 The shrubs Adam Bauman of Bauman’s Best Botanicals creates are drinking vinegars made with sugar, fruits, spices, vegetables, and herbs. The tart beverage traces back to America’s Colonial era. Today we use them in a salad dressing, mixed with soda water, or to deglaze a pan. Most popular these days, though, is to use shrubs to bolster a cocktail. “We’re trying to bring something old that was once wonderful back to the modern world,” says Bauman. He handcrafts these palate refreshers with layers of flavors ($10 for 8 ounces; $18 for 16 ounces) at CommonWealth Kitchen, the food incubator in Dorchester. Strawberries, blackberries, and herbs go into the Berry & Herb shrub. Tangerine & Lavender combines fresh tangerines with lavender. Many of the fruits and herbs come from local farms and purveyors. Bauman worked as a bartender for 10 years at spots like the Kirkland Tap & Trotter and the bars at the Fairmont Copley Plaza and InterContinental hotels, where he discovered the appeal of building craft cocktails with the mouth-puckering elixirs. “I spent a lot of time playing with flavors,” he said. His Cucumber & Spice shrub is in fact a component in a cocktail at Terra, a restaurant at Boston’s Eataly. Yet, many know little about drinking vinegars, Bauman says, so his mission is to educate people about shrubs. He sells his wares at farmers’ markets, and at the front of the table he’s affixed a sign that reads: “What is a shrub?” Please ask. He is happy to tell you. Available at Eataly Vino, Prudential Center, 800 Boylston St., Boston, 617-807-7310; Pemberton Farms Marketplace, 2225 Mass. Ave., Cambridge, 617-491-2244; Mill City Cheesemongers, 250 Jackson St., Lowell, 978-501-3142; Farmer Dave’s at East Street Farm Stand, 460 East St., Tewksbury, 978-851-2048, and at Union Square (Somerville); SOWA (Boston), and Central Flea (Cambridge) farmers’ markets. For market schedule, go to www.baumansbest.com.